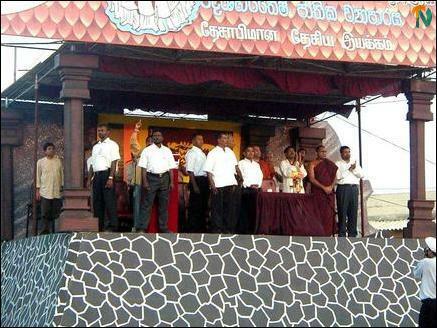 "The Memorandum of Understanding between the Sri Lanka Freedom Party and the JVP forming a political alliance would be signed before January 31," said the Sinhala nationalist, Marxist, Janatha Vimukthi Peramuna (JVP) parliamentary group leader Mr.Wimal Weerawanse addressing a public meeting organized by the National Patriotic Movement (NPM) and held at Trincomalee private bus stand in the heart of the town Tuesday evening. Mr.Wimal Weerawanse further said, "I appeal to the Prime Minister Mr.Ranil Wickremasinghe from this sacred place, Trincomalee, to resign without dividing the country at the instance of foreign imperialists." Since the signing of the ceasefire agreement by the United National Front (UNF) government led by Sri Lanka's Prime Minister and LTTE leader Mr.Pirapaharan, LTTE has increased its military strength and taking steps to bring the northeast province under its strong hold undermining the security of Muslims and Sinhalese and eliminating members of rival Tamil groups. The Interim Self-Governing Authority (ISGA) proposal submitted by the LTTE to the UNF government has proved LTTE's real intention of dominating the northeast province where three communities live. This cannot be allowed at any cost, said Mr.Weerawanse. Under the concept of "Regaining Sri Lanka" Ranil's government has been actively engaged in selling all resources of the country to imperialists, said Mr.Weerawanse. "If we patriotic citizens allowed the present government in power to continue for a few months the country will be divided into two to appease the LTTE and the resources would be sold to satisfy the imperialists," added Mr.Weerawanse. Majority members of the crowd shouted, "we want general election first" several times interrupting his speech. Tamil parliamentarian of the JVP Mr.Ramalingam Chandrasekaran said that the Prime Minister has failed to fulfill the aspirations of Sinhalese, Tamils and Muslims under the ceasefire agreement now in force for more than two years. 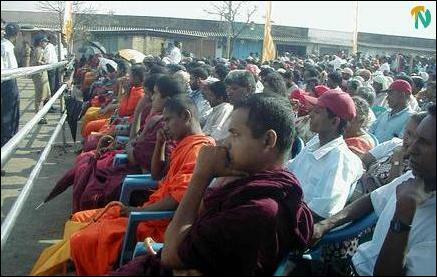 Venerable Elle Gunawanse Thera said, "from Trincomalee I make an appeal to the President to issue a gazette notification immediately to cancel the temporary merger of the northeast province and to appoint two governors to administer north and east separately. This is to be done very urgently to safeguard the sovereignty of the country." 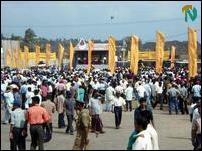 More police and army personnel were deployed at the venue of the meeting strengthening the security. JVP volunteers allowed members of public and journalists after through check to the enclosure close to the stage as a security measure. A former government agent of Trincomalee district Mr.N.H.K.Nelumdeniya presided. SLFP parliamentarians Mr.Arjuna Ranatunge and Mr. Dilan Perera and several others also spoke.